This in many ways captured how I felt about being middle-aged. I knew deep down I was the same person as the awkward freckled teenager who slapped coconut oil in his hair and wore white towelling socks with Romford cut-downs. I knew I was the same as the twenty-something who ate off paper plates, made soul mix-tapes and worshipped at the altar of conversation; the same as the industrious thirty-year-old, the pedestrian centre back who learned to love Bach, Beckett and ballet. But I knew too that I was grey. My knees creaked. My back was playing up. I couldn’t read restaurant menus or hear discussions in crowded bars. I was increasingly sentimental, nostalgic and stubborn. What’s more, I was inclined to talk about bin strategy, travel routes and parking permits at any opportunity. When we reach 50 we have to come to terms with the fact that we have more years behind us than ahead of us; that we’re not quite as in touch as we once were; that our cohort is no longer the cultural centre of gravity; that we are the same, but grey. I recently attended an exhibition of Pablo Picasso’s work from the year 1932, when he had just turned 50 (Tate Modern, until 9 September). By 1932 Picasso was successful, famous and wealthy. He lived a life of bourgeois respectability with his wife and son in his grand Paris apartment. He wore tailored suits and had a chauffeur-driven car. He was planning the first major retrospective of his work. Picasso was middle-aged. His life was characterised by responsibility, conformity and comfort; by nostalgia, self-justification and pining for lost youth. And he was curiously dissatisfied with it all. But Picasso had an outlet for his frustrations and anxieties: his art. He established a new studio above his Paris apartment, and he bought a mansion house in Normandy where he could experiment with sculpture. He set about an extraordinary period of industry and creativity. 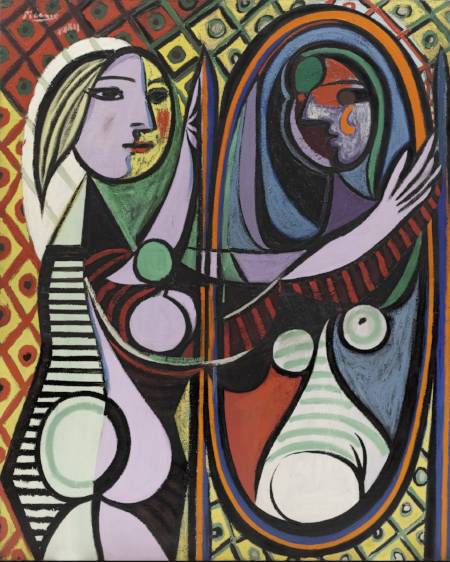 Picasso painted Walter sitting, sleeping and swimming; surrounded by plants, busts and bowls of fruit; in shadows and reflections; bright, colourful images in purple, blue and gold; vibrant two-dimensional portraits like playing cards. He deconstructed and reassembled her; abstracted, distorted and fragmented the female form. There were curved limbs, breasts, hips and hands; a heart-shaped head. Mouths became slits; faces buttons. Walter melted into a squid. Incredibly prolific, Picasso switched seamlessly between painting, drawing and sculpture, producing new ideas every day, creating work in series: surrealist studies; goddesses attended by Grecian fauns; crucifixions; geometric human forms; a village in the rain; and, at the end of the year, the rescue of a drowning woman. One can’t help concluding that Picasso’s inner turmoil in 1932 fuelled his phenomenal creative output; and indeed that his phenomenal creative output helped calm his inner turmoil. Of course by no means did 1932 entirely solve Picasso’s problems. A couple of years later, his marriage disintegrated after Walter bore him a child. And he became increasingly troubled by the deteriorating political and economic situation in Europe and in his native Spain. Perhaps there’s a lesson for us all here. If we are faced with our own mid-life crisis - with the threat of increasing comfort and diminishing relevance - we should not go looking for new relationships, buying embarrassing cars, wearing inappropriate fashion. Rather we should keep our nose to the grindstone. We should actively engage with life and culture - by designing, composing and inventing; by writing, making and building; by creating something useful, beautiful, interesting, memorable.